As the holiday draws near, I find myself thinking a lot about my last Father's Day with Daddy. June 2010 - I'll never forget it. He was in the hospital... again. I made sure I stopped to pick up some flowers and a card before I went by. I always take my time choosing cards for people because I want them to say what I feel toward that person. I figured that Daddy wouldn't really read it, but I still took the time to get just the right card. I can't remember now exactly what it said, but I know it expressed my heart toward my father practically verbatim. I walked into his room and I remember thinking, "Wow he looks more like himself than he has in a long while..." I handed him his card, showed him his flowers [I believe I am the only one who's given either of my parents flowers! ], and went to put them in the vase in his room. Then I sat down in the chair and started talking with my mom. I looked over and saw daddy looking at the card and turning it over in his hands. He studied the picture and ran his fingers over the raised writing on the front. I had never seen him do that before. I went back to talking to Ma and when I looked again he was reading the card. [Understand here that because of the dementia, Daddy didn't read much anymore. The disease affected his comprehension and so he simply avoided reading or he would sometimes pretend to read. The disease affected a lot of things...] I glanced over at him again and he was clearly reading. He finished reading and a strange look came over his face. He motioned for me to come to him, he said he wanted to hug me. [Daddy was never a hugger or particularly affectionate, plus he was hooked up to the monitors and IVs and such which have always made me nervous] Still I went over to his bedside. The moment he put his arms around me, my father did the third thing that he'd never done before - he burst into tears! Not just tears running down his face kind of tears either. 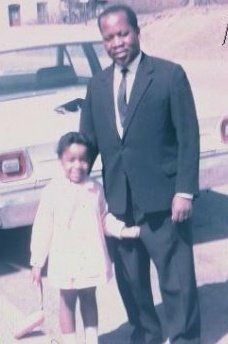 No ma'am, my daddy, the strongest man I knew, bawled like a baby. Mom and I were so unprepared for his reaction. His monitor started going crazy, his numbers were going up and down, mom rushed over to try and calm him down. I was so affected by the depth of emotion from my dad. It was as though through that one act our love and understanding for one another was sealed... And not a moment too soon either since he was gone three months later. Like I said, I will never forget it and it is one of the many memories that feeds my soul and gives me strength and peace to get through the hard times. Tomorrow is not promised to any of us, beloved. If you still have your dad with you, can I beg you to do something to make Sunday special for him. Treasure the time you have with him and don't let the past keep you distant. Pick up the phone, drop a note in the mail, shoot him an email or a text, but do reach out. You may never know how it will affect him... or you. Happy Father's Day to all the strong wonderful men out there who refute society's stereotypes of fatherhood on a daily basis. You are appreciated!